Awnings serve a variety of purposes. Number one is protection from weather extremes. Whether there is a hot sun or a hard rain, a canvas awning provides a barrier between you and the elements. 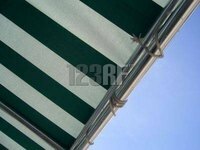 Awnings are found on campers, over the windows of mobile homes, even self standing on the beach. A good-sized, heavy-duty awning can be expensive, and so some people have opted to make their own. Cut a large canvas to size. Hem the edges using an industrial-strength sewing machine. Measure the canvas size and then mark the area on your house. Drill a hole in each corner of the house where the canvas awning will hang. Insert hooks into the pre-drilled holes made in the house where your awning will be installed. Attach grommets to each corner of the canvas. Attach a 1-inch metal ring to the two corners that will be attached to the house. Drive two metal poles, or PVC pipes, into the ground where your canvas awning will extend to. Place metal rings that fit over the poles into the two grommets on the opposite end of the canvas. Place them over the poles. Tie a long section of rope to each grommet and stake the ropes into the ground. This helps stabilize the awning and prevents it from blowing away. You can install as many grommets and hooks as needed for securing your canvas awning. Don't attempt to cut canvas material with simple household scissors. Use heavy duty scissors and a heavy duty sewing machine.